After what seems like a long spell of dryness in the creativity department, ideas are coming to mind in a rush. They cover the gamut of my life - from writing to sewing to gardening to cooking to home improvements. It's fun, but somewhat overwhelming. Focusing on a particular palette helps - these days, I'm attracted to the pinks and greens of early spring, to freshness. So I gather - threads, fabrics, ideas - and hope that the result will be as I've envisioned. What are you gathering, literally or figuratively, these days? Wow, your mosaic is beautiful. Pinks and greens. The perfect colors! I am gathering weddingy stuff right now for my upcoming nuptials. Such a beautiful mosaic! And I love the sweet embroidered flowers. Putting the French knots on the outside is charming! Pink, green and cream...I could live with those colours very happily. The threads and fabrics of your mosaic are nice spring colours Lorrie. I will be gathering winter debris from the gardens again this week I hope, as it warms up to proper spring temperatures. Love all the pretty fabric and lovely embroidery. Happy Spring! This has always been a favorite palette of mine! I love the pinks and greens, very pretty. Have a happy evening and great week ahead! Oh my such a pretty mosaic. I love the pink and green together. Such pretty colors! I am a bit unsettled right now because I don't feel that I can start any project. We'll be hitting the road soon so we got to start doing the last minute preparations. I planned to do some landscape photos today, but the weather turned dismal. And we planned to go to the Smokies on Wednesday, but now they are predicting rain. It's too early to plant flowers, so that task has to wait until we get back. Your mosaic makes me smile. Favorite color combination of mine. Your projects look promising and inspiring and enjoy them all! How pretty! I would so love to do some embroidery. I have lots of thread....I just need to start a project! Your Spring flowers are such a sweet design! Oh such lovely colors - they are my favorites. I am collecting photos - trying to learn to do photos of dishes - so I have a lot of them to study so I can get better at it. I'm also collecting little doodads to go in the photos - things that lend interest to a shot. Such a pretty mosaic! Dainty, fresh , springlike etc...love it! Oh such beautiful color of fabric and thread. I think mosaics are so lovely using the same color, yours is lovely. I'm the same as you. I love pink and green together and your fabric and thread looks so good in your mosaic. Oh no Lorrie - just seeing your delicate, really pretty embroidery, is making me want to take up some of my own again. I used to do this long ago and must admit it's the type of needlework I want to try again. I just might be paying a visit to Jo-Ann's Fabrics this week, if I can tear myself away from the garden chores! I'm still knitting - scarves of course - and for the latest one I'm trying to make little knitted 'roses' to embellish with. I think they will look good - so will get back to that before starting anything new. I'll be away again on a ship next month so perhaps can take some needlework to do then - always time to kill during at sea days! Love your colors here - really Springlike. I hope one day I will get back to sewing and embroidery. I used to do a lot at one time. For now I just take photos - heaps of them! It is my creative outlet. Have a wonderful week and thank you for stopping by my blog today. I used to embroider. It's so pretty. You made a pretty mosaic - nice and springy. A beautiful mosaic Lorrie of things I just love. Pretty fabrics which look like Liberty voiles - I love each one and I can imagine sweet little dresses for Spring and Summer! 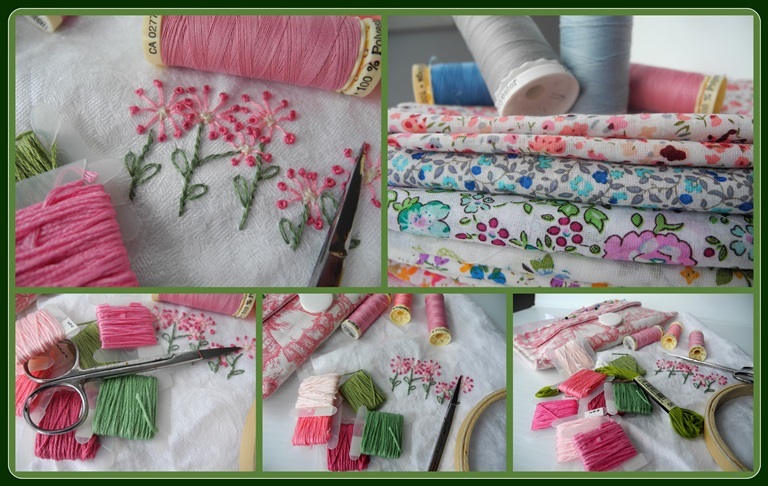 Your pink and green embroidery and cottons do have that wonderful freshness of Springtime too! Your embroidery is very pretty, Lorrie, and I love the pink and green color combination. It must feel good to find your creative muse! I love your mosaic - such pretty colours and your embroidery is beautiful - just right for Spring! How sweet these are. My mother used to love to create things like this, and these days, I cherish them so much!